Today I was suspended from Twitter. I never thought I would utter those words, yet it’s true. I was in great company, however, please see below who was with me in my isolation. First: Shock. Disbelief. Terror. Sadness. Exhaustion. I started to wonder what it would take to locate all 16k of my follow-friends and get them to follow me on my alternate account @AnitaNelson. Then I thought briefly about quitting Twitter. Was this the wake up call I needed? I even tweeted it! I felt rejected for a moment as if Twitter actually WANTED to suspend me and didn’t love me anymore. If you are suspended, here is the status update from Twitter. You should ALWAYS check “Status Blog” before taking any action. You should file a ticket with support if you have a problem that cannot be found in “Known Issues”. Twitter has a ROCK STAR employee @delbius who freed my friends and me from banishment. Please don’t harass her, but know that you should FOLLOW @delbius more than @aplusk. She deserves a raise for this and all the other work she does from home on holiday weekends! This is not the first time she has come to my aid. I did not want to draw much attention to her, but cannot help it, in the end. So please know this is her personal account – do not bother her – if you are accidentally suspended, send her ONE @reply and include the Support ticket number if you have one to help keep duplicate requests to a minimum. PLEASE do NOT ask for RTs on any support issue or message to Delbius! I would like to thank @PowerSellingMom for “talking me down” from my addiction to Twitter, riding through the rapid highs and lows, taking me from tears to laughter to giddiness when my account was reinstated. I will blog about what happened, um, as soon as I find out! Notice the language in the top post? That guy’s account was just fine! Please comment if you were left off this list or sign this PETITION by @MattSingley and I will update this post FREQUENTLY, so please refresh the page! See Related Article. 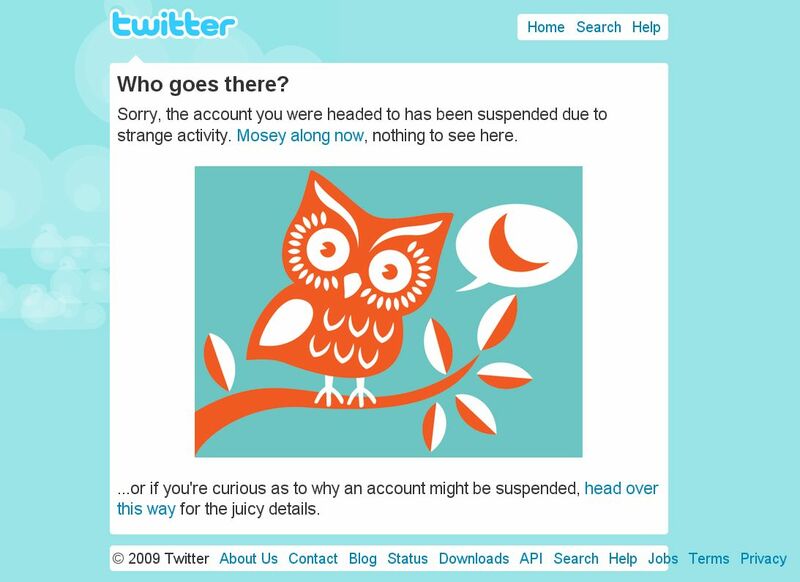 Earlier today, we accidentally suspended a number of accounts. We regret the human error that led to these mistaken suspensions and we are working to restore the affected accounts—we expect this to be completed in the next several hours. I was going to wait to post that update, but it looks like Twitter would rather not talk about it. Hey, Twitter is free, right? So who am I to press? This entry was posted in Twitter and tagged suspended account, Twitter. Bookmark the permalink. check out what i did while suspended on my blog made fun of iranian president.. funny pics so bored . I do hope they don’t do that very often. Many thanks for including me on your list , Anita. Whew, so glad to see we’re back up and running in the Twitterverse. For sure a bizarre experience today – I had every confidence we’d be reinstated… just didn’t know how long. Four hours felt like four days!! lol. Yes, it caused me a lot of grief. Glad to be back. 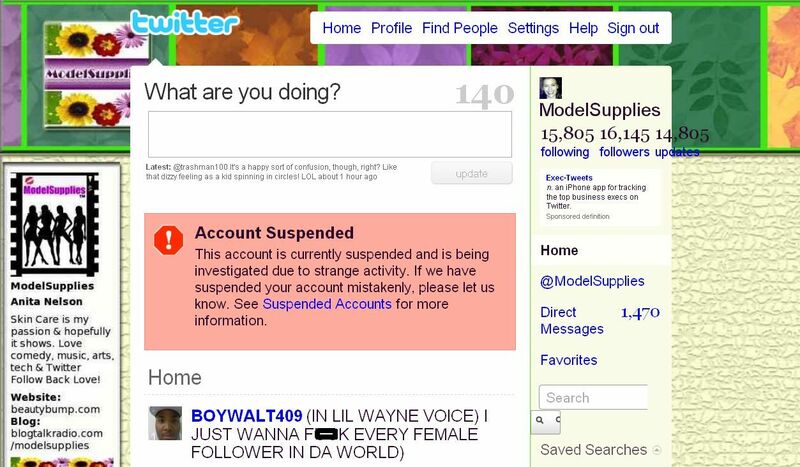 I was one of the ones suspended as well! It was frustrating to say the very least! Whew! I thought I was the only one! I took my account’s suspension very personally! Suffered some MAJOR twitter withdrawal symptons yesterday! Thanks for the tip on the Twitter employee extraordinaire – I will be keeping that name handy! Banned once. Ticket sent out and The Support Desk says about “Spam Cloud” problem. Not really sure what does it mean exactly. Any explanation about that Anita? No explanation yet…Twitter says all were using TweetLater, but it is not a violation of their terms. I tried to schedule one tweet w/TweetLater & it did not work. I was using HootSuite for timed tweeting. It WAS a nightmare, Anita – so glad you and a few others were right there to guide us through! Thanks again!